In a very real sense, Richard Matzkin’s life has come full circle. He showed an early talent for the arts but in the 60s his interests changed to music and psychology. Some 20 years later his wife enrolled him in a clay sculpture class and he again found a natural inclination for art. Disturbed by the changes he was experiencing as he entered late-middle age, Richard’s work turned almost exclusively to depicting older men and couples in loving embrace. His art does not try to hide or “prettify” the effects of aging; it does convey the humanity and wisdom attained over a lifetime. His work reminds us all of the challenges and rewards, the sadness and serenity that await us in our later years. 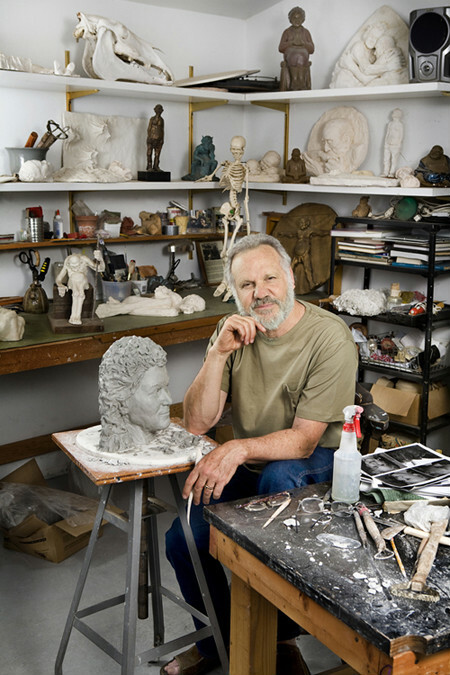 Richard and his wife Alice Matzkin, FOTM documented artist, live in Ojai and are members of the Ojai Studio Artists. In 2009 they published The Art of Aging: Celebrating the Authentic Aging Self. The book addresses the curiosity and fear they and others feel when confronting old age and reflects their own loving, mature relationship. Richard Matzkin’s documentation took place in 2010 and was sponsored by Paula Spellman. The FOTM Archive contains extensive information about this artist.